An adventure game where your character moves around by manipulating the attractive and repulsive forces of the atom. A 3D battle against pathogens inside the human body. An early learning game starring a shark that teaches first graders about inequalities. 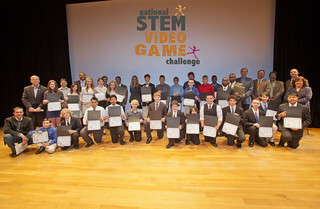 They could be the latest releases from a premiere educational game studio, but these and 14 other incredible games were all made by students between the ages of 10 and 18: the winners of the 2012 National STEM Video Game Challenge Youth Prize. 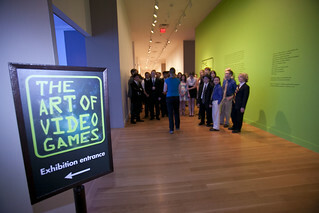 On Monday, May 21, I had the pleasure of participating in the Challenge’s Celebration of Success, where 28 youth game designers from around the country — out of a field of over 3,700 entries — were honored for their original game designs at an event held at the Smithsonian American Art Museum in Washington, DC presented by Challenge Sponsor Microsoft. The youth winners began their visit with a VIP tour of the Smithsonian’s Art of Video Games exhibit where they got to see and play some of the most significant titles in the history of gaming. Then it was off to the auditorium where representatives from the game industry, government, and the educational community — along with family and friends — recognized the designers for a job well done. Challenge judge and game designer Sean Vesce of 20after1, whose work includes titles like the Tomb Raider and Mech Warrior franchises, praised the designers’ work and talked about his own experience as a young game maker inspired by some of the great early Activision titles. Alex Games, Education Design Director at Microsoft also addressed the youth, telling them “You did something awesome! Making games, like anything good in life, takes a lot of hard work, a lot of perseverance and a lot of not giving up.” Dr. Games was followed by video congratulations to the winners from celebrity Challenge judge (and self-professed nerd) Zachary Levi of NBC’s Chuck. Joining the sponsors and game industry professionals in praising the young designers were Representatives Debbie Wasserman-Shultz and Jim McGovern as well as Cristin Dorgelo, Assistant Director for Grand Challenges at the White House Office of Science and Technology Policy. Following the ceremony, several of the winners of had the opportunity to demo their games for the guests in attendance. You can meet the 2012 Youth Prize winners and see some of the amazing things they’re doing in the video below. You can also check out the complete winners list here with footage of each of the winning games and even links to play a few online. Brian Alspach is Executive Vice President and General Manager for Gamestar Mechanic at E-Line Media.